Curiosity House serves up a Dime Museum filled with oddities, numerous murders, four “gifted” children, and one shrunken head. The pace is peppy and the premise clear: Find the shrunken head and save the museum. On this quest are the four children around whom the book is centered. Each has a unique “gift” that helps them out of scrapes but also landed them in the museum in the first place. One boy has incredible strength; another a bendable body that allows him to fit into tight spaces; one girl can intuit what people have in their pockets; the other girl can pick those pockets as well as sling knives with pinpoint accuracy. A frisson of potential romance among these four runs throughout the adventure. The reader is alerted early that these children have a history, possibly unsavory, probably together. 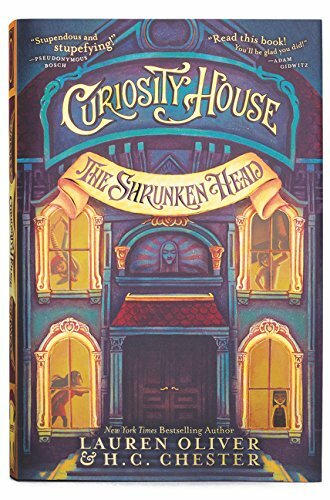 But this first volume in a promised four-book series stays mainly in the present, where their protector, Mr. Dumphrey, is doing all he can to keep the doors of the Curiosity House open. Most recently he has acquired a shrunken head. Unfortunately, rumor has it the head comes with a curse. The murders commence almost immediately, and Mr. Dunphey is accused. Our four intrepid heroes, grateful to Mr. Dunphey for taking them in (although he does feature them in his freak show performed daily in the Odditorium) set out to get him out of prison and clear his name. This adventure/mystery is set in the 1930s and provides a smattering of history, occasional grammar and vocabulary lessons, a smidgeon of poetry, and many nail-biting close calls, false leads, and dead ends. Despite all the fun, the author’s underlying message is serious and will likely resonate with some readers: Our differences might set us apart, even cause others view us as “freaks,” but they don’t make us less than and might even have a terrific upside. The cast of characters is extensive, but the author does a good job of reminding the reader who’s who. And there’s plenty of humor and many quirky details to delight young readers. Oliver keeps the ride exciting right up to the final scene. She dangles a delicious hook at the end, which is sure to send readers scurrying to book two.